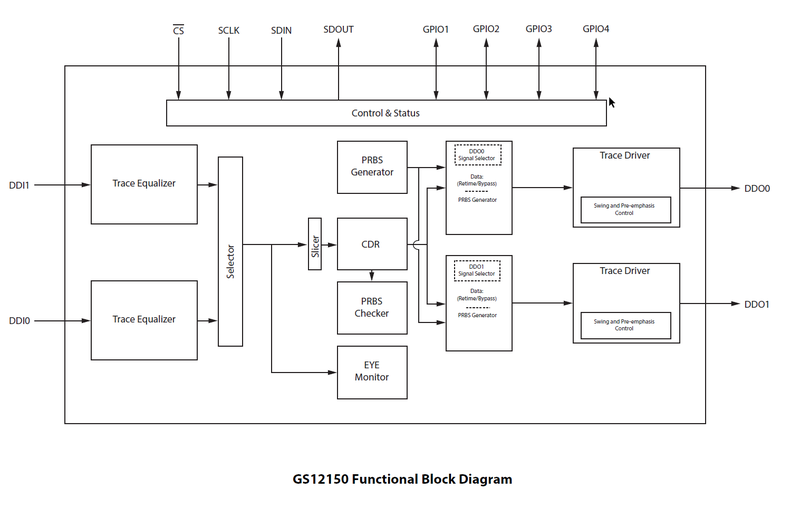 The GS12150 is a low-power, multi-rate reclocker that features both an integrated trace equalizer and trace driver, supporting rates up to 12G UHD-SDI, inclusive of 10GbE. It is designed to receive 100Ω differential input signals, automatically recover the embedded clock from the digital video signal and re-time the incoming data. Each of the 100Ω trace inputs supports up to 17dB of insertion loss. The integrated eye monitor provides non-disruptive mission mode analysis of the post equalized input signal. The 256x128 resolution scan matrix allows accurate signal analysis to speed up prototyping and enable field analysis. Built in macros enable customizable cross section analysis and quick horizontal and vertical eye opening measurements. With high phase consistency between scans and configurable space and time thresholds, algorithms can be deployed in the field to analyze long term signal quality variation (Bathtub Plot) to reduce costly system installation debug time for intermittent errors. The two independently controlled trace drivers have highly configurable pre-emphasis and swing controls to compensate for long trace and connector losses. The pre-emphasis pulse width and amplitude can be optimized to compensate for perturbations to frequency response of transmission lines due to vias, connectors and stubs. Re-timing at the following data rates: 125Mb/s, 270Mb/s, 1.485Gb/s, 2.97Gb/s, 5.94Gb/s, 11.88Gb/s, and 10.3125 Gb/s. This includes the f/1.001 rates. Next Generation 12G UHD-SDI infrastructures designed to support UHDTV1, UHDTV2, 4K D-Cinema and 3D HFR and HDR production image formats. Typical applications: Cameras, Switchers, Distribution Amplifiers and Routers.